ATLANTA – Atlanta Public Schools has stepped up security at Boyd Elementary School after it was hit by criminals twice in less than two weeks. Authorities say the two incidents are not related. Then over the weekend, police arrested three different suspects after catching them breaking into the school. Kijon Griffin, Marcellus Copeland and a juvenile are being charged in that crime. The three were attempting to steal various items, including computers and projector screens, from classrooms, police said. The incidents that occurred at Boyd Elementary are unrelated. However, the perpetrators involved in the burglary this weekend were apprehended. ATLANTA -- Atlanta police have made three more arrests in a recent home invasion in which a father was shot. Michael Lash was shot in both legs after he tried to stop several men from entering his Sumter Street home on August 16. The gunman allegedly shot at Lash's wife, Whitney, as she held their young daughter. On August 21, police arrested the alleged shooter, 18-year-old Brandon Jerome Smith. ATLANTA -- Atlanta Police are investigating a fatal shooting in a barbershop parking lot. The victim, whose name was not released, was found at around 6 a.m. Thursday. He was lying unresponsive in the parking lot of Boyz in the Hood Barber Shop in the 2500 block of Donald Lee Hollowell Parkway. Police said the victim suffered a gunshot wound to the upper torso. He was pronounced dead at the scene. No suspects have been named in the shooting. ATLANTA -- Atlanta Police have arrested a suspect in a recent home invasion where a father was shot in both legs. Investigators announced Friday morning they arrested 18-year-old Brandon Jerome Smith. Atlanta Police Department spokesman Kim Jones said police are searching for three additional suspects, but investigators believe Smith was the shooter. Atlanta Police Chief George Turner said Smith was "young and dumb. Where did he think he was going to go?" The home invasion happened Sunday evening at a home on Sumter Street in northwest Atlanta. The homeowners, Michael and Whitney Lash, told police several men stormed the house. They fired shots at Whitney, who was holding the couple's infant daughter, then shot Michael, shattering his femur. ATLANTA – Police have released the sketch of a man who allegedly fired shots during a home invasion Sunday night. According to police, Michael Lash was shot in both legs after he tried to keep several men from storming into his home on Sumter Street. 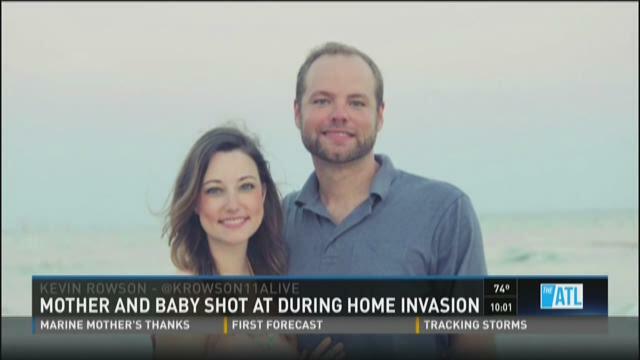 The gunmen fired shots at Lash’s wife, Whitney, who was holding their infant daughter, but missed. She was able to flee to a neighbor's home. ATLANTA -- It’s been one year since Ronit Pinsky experienced one of the most terrifying events in her life. As the sun set over dance studio she had visited hundreds of times, Pinsky, was attacked, robbed and carjacked. Police said the suspect, a black man in a blue shirt and brown jacket, jumped out from behind a parked car and attacked her. Pinsky said he put a gun to her shoulder and she promptly gave him what she had. He then took her blue Lexus mini-SUV. Police originally said that attempts to use the credit cards that were in her purse were encouraging. And after the incident, the owner of the dance studio vowed to install cameras. ATLANTA -- Residents of Atlanta's Riverside community filled a community meeting Tuesday looking for answers from police, two days after one of their neighbors -- Michael Lash -- was shot, and his wife shot at by intruders. The gunmen shot and wounded Lash as he fought to keep them out of his home Sunday night, Atlanta police said. His wife and baby daughter escaped but not before they were shot at twice.